We shall learn how to edit a project's information, organize tabs, and access Zoho Projects through your registered email address. Click to learn more about access privileges for Project Settings. Navigate Project Settings > Project Details. Here, you can edit the project information for the all the projects in your company. Modify the project's data wherever necessary. Organize the project tabs based on your choice. You can drag and drop the tabs to reorder and save the new order. In addition, this feature is also extended for client users. Navigate Project Settings > Organize Tabs. Here, you can select a project and choose to show or hide specific modules in the selected project. Select Project to ensure for which project the tabs are going to be customized. In the Project Users section, you can configure the set of tabs that have to be hidden from the project users. Switch off the unused tabs. Drag and drop (reorder) the most used tabs in the way you want them to be. 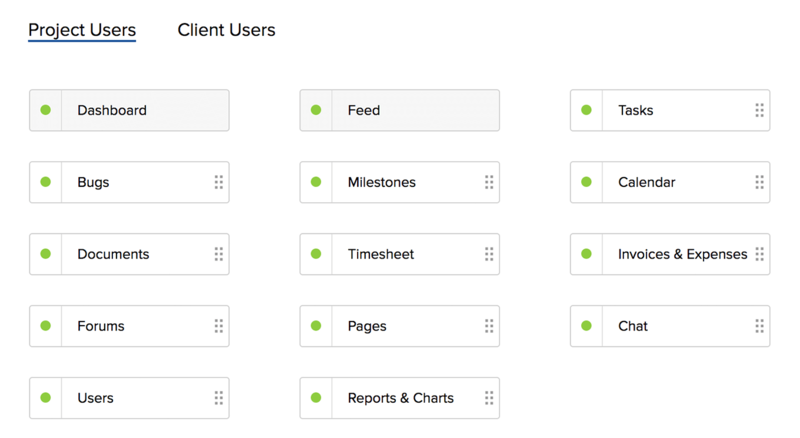 In the Client Users section, you can configure the set of tabs that you would like to share with the clients. This way, they can view the information only from the tabs that have been enabled for them. Save the new order as and when needed.